Jeep® hints at global portfolio expansion with world premiere of Jeep Patriot and Jeep Compass concept sport-utility vehicles at the 61st International Motor Show (IAA) in Frankfurt - Pair of compact Jeep SUVs designed to appeal to all-new buyers - Two concepts complement each other, yet target different consumers. FRANKFURT, Sept. 12 /PRNewswire-FirstCall/ -- Jeep® designers have gone to the extreme once again, creating two all-new sport-utility-vehicle (SUV) concepts that could expand the Jeep brand into new territory. The Jeep Patriot and Jeep Compass concepts are compact Jeep 4x4s that would deliver fun, freedom, utility, capability, as well as the potential for exceptional fuel economy and interior flexibility -- all at a great value. Making their debut at the 2005 International Motor Show (IAA) in Frankfurt, these concepts hint at two future compact SUVs that the Jeep brand could build for global markets as soon as next year. The two very distinct interpretations of a compact Jeep complement each other, yet target different sets of customers who seek great value and fuel efficiency. The Jeep Patriot and Jeep Compass concepts would expand the brand's global lineup, which includes Jeep Commander, Jeep Grand Cherokee, Jeep Liberty (Cherokee outside North America) and the legendary Jeep Wrangler. "The Jeep Compass and Jeep Patriot concepts prove Jeep continues to explore new territory," said Trevor Creed, Senior Vice President - Chrysler Group Design. "These concept vehicles would allow Jeep to provide best-in- class capability to the compact SUV buyer at a great value, and do so with the credibility that only comes with a Jeep." Strong and capable, the Patriot concept is unmistakably Jeep®, designed to appeal to compact SUV buyers who want traditional Jeep styling with best- in-class off-road capability. Jeep Patriot is rugged, exuding the brand's key attributes of mastery, authenticity, freedom and adventure, but would still offer exceptional fuel economy, interior flexibility and utility at a great value. "Simple, geometric forms and planar surfaces define Jeep Patriot's timeless, purpose-built design," said Creed. "Patriot's face features Jeep's signature seven-slot grille, a robust bumper, round headlamps, raised, free- standing fog lamps and a visible skid plate. All of this gives Jeep Patriot its robust, strong, capable off-road image." Painted Armour Green with black door handles, body-side moldings, black accents, dark tinted windows and a stiffer windshield, Jeep Patriot would be built for maximum cargo volume, rugged driving conditions and excellent utility. Four doors and a rear liftgate provide easy access to the Jeep Patriot concept's spacious and functional interior. Classic Jeep design cues include aggressive 17-inch off-road wheels and tires housed inside signature Jeep trapezoidal wheel openings. These combine with a raised roof rack that can hold additional gear to provide a no- nonsense, functional statement. 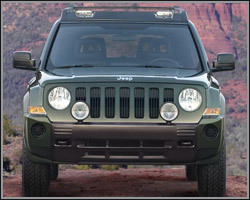 Jeep Patriot's higher beltline completes the vehicle's protective profile. The rear of the vehicle features an upright backlight and a bold bumper that further illustrate the Jeep Patriot concept's interior spaciousness and add to its rugged appearance and capability. Sleek and sophisticated with a rally car toughness, the Jeep® Compass concept would deliver Jeep fun, freedom and capability, broadening the global appeal of Jeep and attracting new buyers who might not have previously considered the brand. "The Jeep Compass concept is an all-new kind of Jeep," Creed said. "Compact and nimble, the Jeep Compass concept is the right size for world markets and would offer performance, fuel economy and value in the highly competitive compact SUV segment." True to Jeep's signature design cues, the Jeep Compass concept features the brand's signature seven-slot grille, round headlamps, large and capable fog lights and trapezoidal wheel openings. A steeply raked windshield, an expressive hood, low-to-the ground stance, deep fascia, wire mesh grille texture and prominent lower intake give the Jeep Compass concept a powerful and capable appearance. The Jeep Compass concept's side profile is highly sculptured. 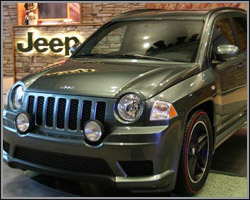 Powerful fender forms exaggerate the Jeep Compass concept's athletic stance, performance 19-inch wheels and red-line tires. The heroic heritage of Jeep® and its dominance of the sport-utility market stretch back more than 65 years. Jeep is known worldwide for its core attributes of mastery, authenticity, freedom and adventure. The Jeep Compass and Jeep Patriot concepts, with excellent fuel efficiency, an affordable price and proven Jeep capability, would provide an opportunity to expand the brand and attract new buyers around the world.